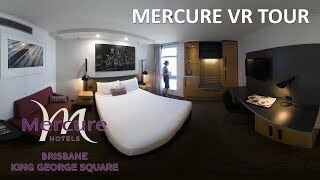 This beautifully appointed hotel, Mercure Brisbane King George Square, enjoys a proud history as Brisbane's first international hotel, superbly positioned adjacent to Brisbane's historic Town Hall and King George Square. Conveniently situated in the central business district with easy walking distance to the Queen Street Mall shopping precinct. The hotel features a grand lobby, an array of dining options, 24 hour room service, concierge desk, extensive conference and function facilities, a business centre, gymnasium and heated rooftop swimming pool. Two standards of accommodation are offered including the contemporary vibe of the Mercure Superior rooms and the adjoining upscale guestrooms and suites of the Pullman tower. The hotel is also the home of Sixteen Antlers Rooftop Bar, one of Brisbane's best places to unwind in the central business district with unobstructed views of the city from 16 floors up.